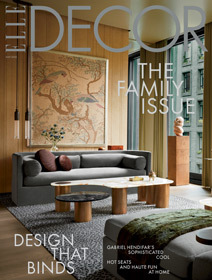 Fill in the fields below to get 1 FREE issue of ELLE DECOR Magazine and be automatically entered for your chance to win. If you'd prefer to enter the sweepstakes without getting a free trial, click here. If you like what you see, you'll get 1 year (for a total of 11 issues) for just $10.00 — that's 85% less than others pay on the newsstand. If not, return the bill marked "cancel" and keep the first issue with no obligation. You'll still be eligible to win the sweepstakes.